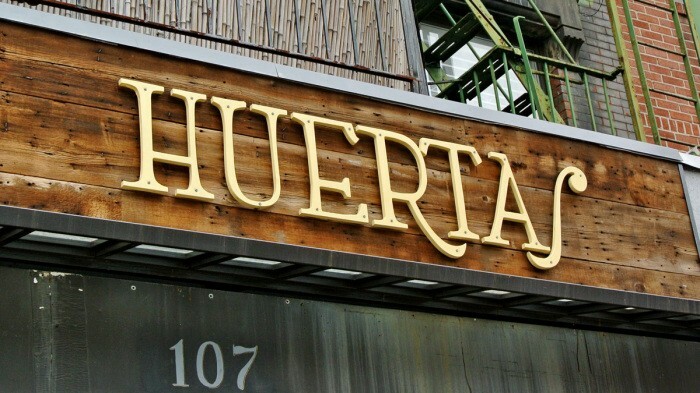 I completely ignored the opening of Huertas in the East Village when I first heard about it. 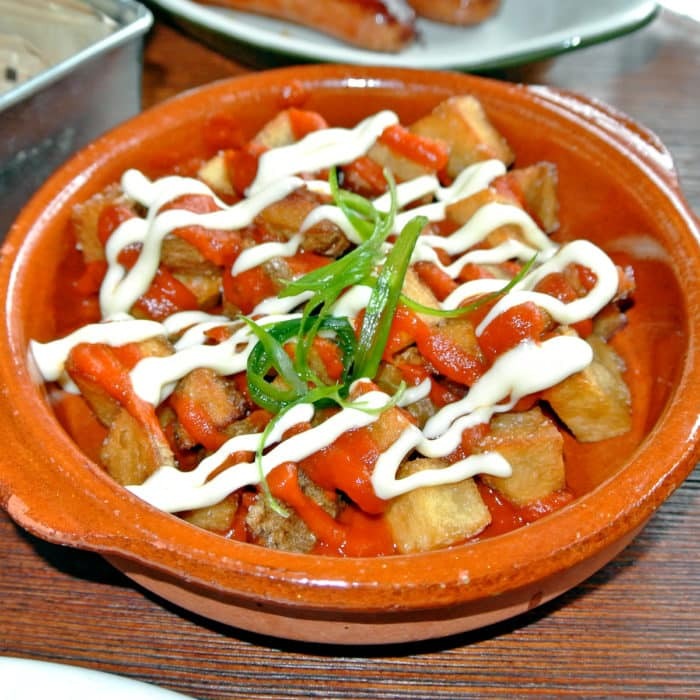 All too frequently I find myself disappointed by tapas joints, so I often don’t bother to give them a chance. But, then I read a glowing write-up from my most trusted food writer – Robert Sietsema that made me completely reconsider. My tastes pretty much always fall directly in line with his, so I knew that if he loved the place, I was probably gonna love it too. Granted, I was heading there with a few people for brunch as opposed to experiencing their Basque style tapas dinner full of small plates called pintxos that Robert had raved about. So, there was still definitely quite a bit of mystery down the untrod brunch-time path and no guarantees of excellence to be found. Inside, the restaurant was gorgeous. It was really beautifully designed like a fancy cavern and was very spacious, though I can certainly imagine the standing room by the bar getting crowded during their cheap tapas-filled happy hour. We fortunately had absolutely no difficulty reserving a table for four on short notice, which means quite a lot in a city where people frequently wait an hour plus for coveted brunch tables. Once we were seated, we each put in our respective main courses before diving into a few brunchy small-plate sides. First, the Papas Bravioli which were basically the same as the cubed potatoes you often see in Spanish tapas joint referred to as Papas Bravas. Their version was really nicely executed – topped with a heavy drizzle of creamy mayo and a wonderfully complex, chunky red sauce. Yeah, that red sauce was incredible. It totally made the dish. In addition to the potatoes, we also went with a duo of breakfast meats: House Chistorra Sausage and House Pimenton Bacon. I somehow managed to forget to snap a photo of the chistorra, but I can tell you with absolute certainly that it was totally delicious. Think about glowing red, moist chorizo sausages around the size of breakfast sausage links and you’ve got the idea. 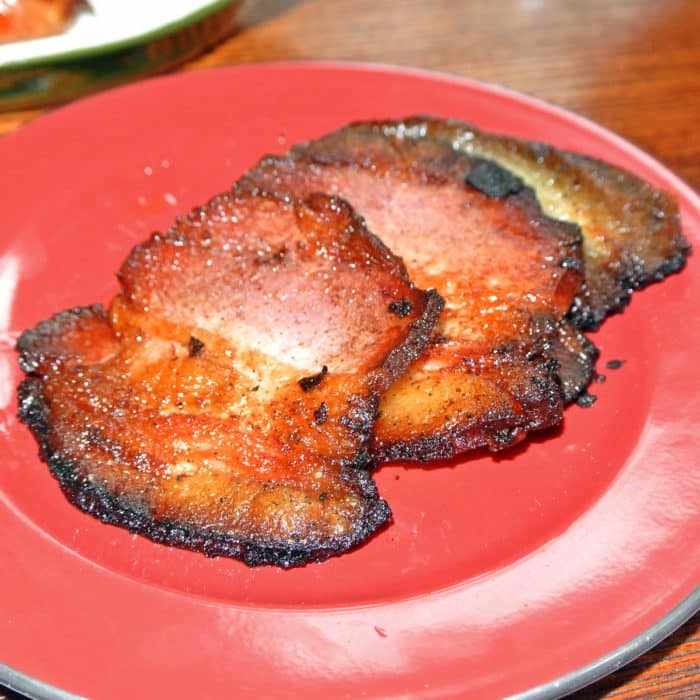 But even better than the sausages was that House Pimenton Bacon. Holy bacon Batman! This stuff was thick-cut, meaty, and grilled until it was hot and crispy, but not overdone. The fatty bits burst with flavor and every single piece had a sort of sweet, but not overly sweet sugary glaze coating the exterior. This was really just wonderfully sweet and savory bacon – a perfect brunch companion. For Amy’s brunch main, she went for a mysterious dish called ‘Huertas Rotos’. 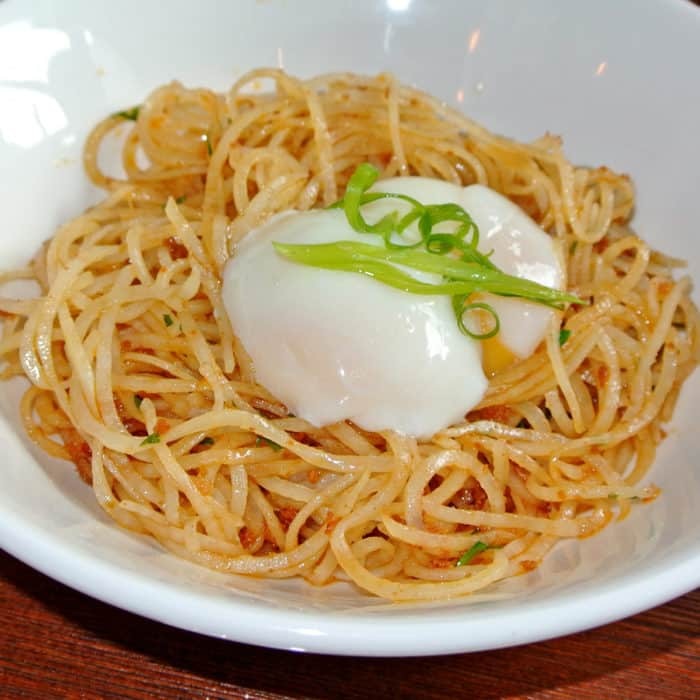 What ended up arriving was a bowl of potato strands peeled with a spiralizer to look like noodles topped with chorizo & perfectly poached eggs. This was a truly unusual dish. 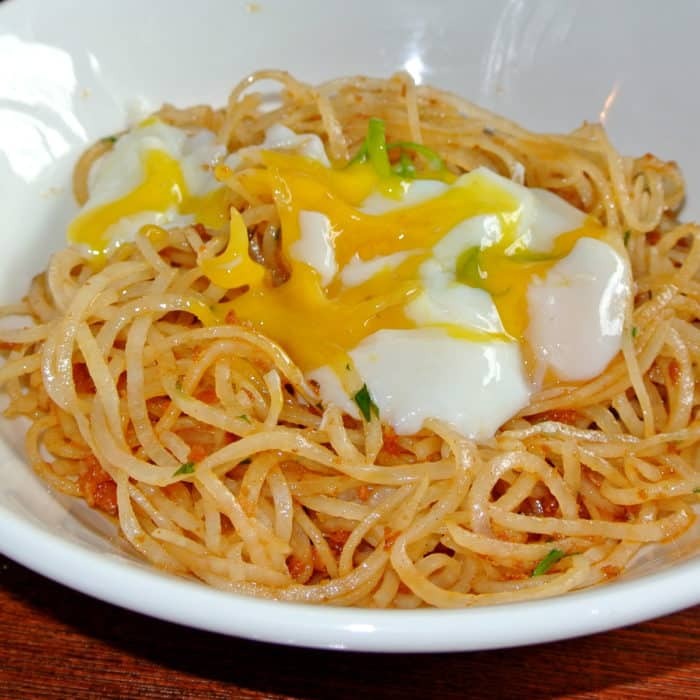 It was sort of like Spaghetti Carbonara except the noodles were made of raw potato, the pancetta was replaced with chorizo, and the poached eggs were seated in a pool of glowing orange chorizo oil. We popped the yolk, stirred it up, and it was really nice as is, but we decided to add a touch of black pepper and flaky sea salt to really open it up. This unique dish was very delicious and really something quite special. For my main, I selected the Calamares Fritos Sandwich. The first thing I noticed about this little bocadillo sandwich was its diminutive size – like really small. But, it ended up being very very satisfying, particularly when eaten along with the included citrusy side salad and hearty brunch sides I’ve already talked about. 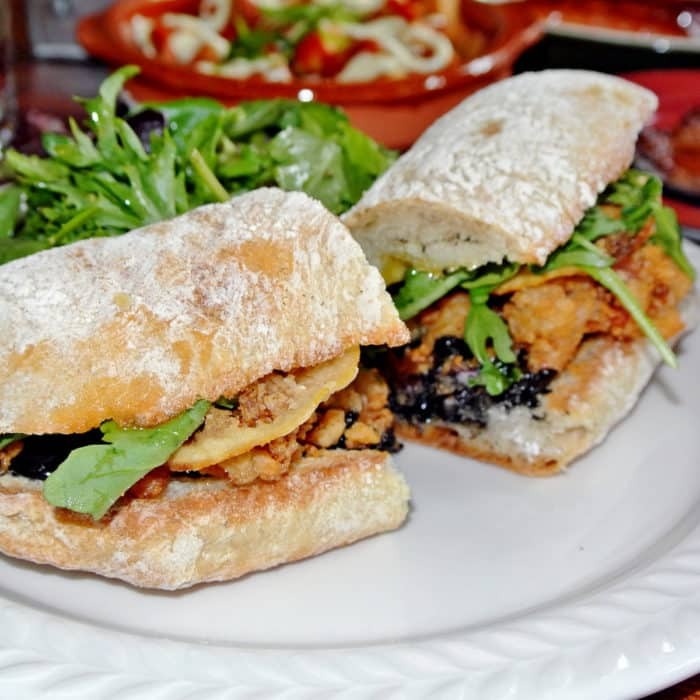 The calamari inside was perfectly fried, and the bread had a nice texture, but the most incredible part about this sandwich was the squid ink aioli. That jet black sauce was the key to this dish’s excellence and really tied all of the elements together with its deep flavor and creamy adhesiveness. So, if you’re looking for a new NYC brunch spot that’s a little different than your standard Eggs Benedict spot, give Huertas in the East Village a shot. Everything we ate during brunch was absolutely delicious – I’ll definitely have to return to try their wide array of Basque tapas next time. 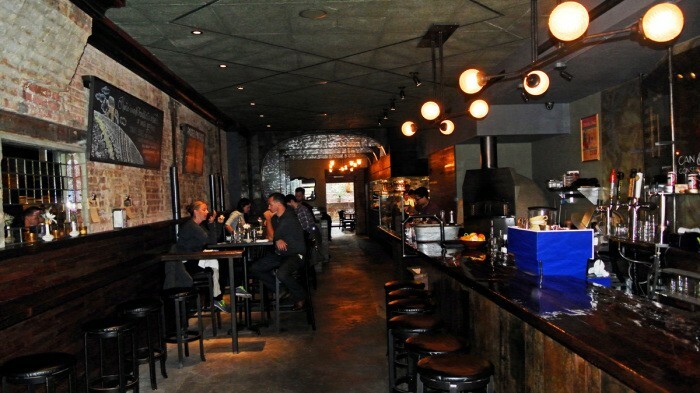 Got another great and unusual brunch spot in NYC that I should check out? Let me know in the comments below.